Like the snazzy new decorations on the blog? I felt that is was time to start getting festive with the theme. I hope everyone had an excellent Halloween. It is such a wonderful holiday. I thought about what review to post that would coincide with the creepy and really just could not choose an exact book to match, there are just too many good ones. Instead, I handed out treats to the little ones at work dressed in full Harry Potter regalia. Sweet nerd moments. And now we are into November. Crazy! The series continues to be a wonderful fairy tale in the constellations. The story opens pretty painfully but with something that is unfortunately all too prominent these days for young readers. You can tell from the title and opening chapter that this novel is going to deal with the darker side of our hearts. While sadness rains down upon his family, Jackson eagerly pushes forward to his dear Arcas where there is no personal pain just hopeful longing for a princess. Boy does he get a handful when he touches down! This novel is action packed from the start. This go around we get adventure in the vein of a pirate escapade or maybe Indiana Jones, in my opinion, instead of a Greek mythology quest like the first novel. All the players have been laid out and the world developed. Now we get to just appreciate a good run through the wilds--if only life were that simple. 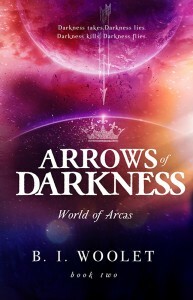 Jackson arrives in Arcas to a new overlord who plans on being worse than the first. From his first moment, he must pick up the hero's mantle again. All of the characters are back from the first novel with even more to offer. I really enjoyed the development of Princess Andromeda's parents. And then there are the actual pirates. Classic. Another fun read with plenty of astronomy and mythology in there as well. We tangle with the darker issues facing children, but in a way that builds constructive conversation. These continue to be great books for the classroom. They are engaging and have so much potential for science lessons right along with the story. I will continue to strongly recommend these books for young readers, parents, and teachers alike. Here's to the holiday season!